That's $414 worth of "Cheering" right there. 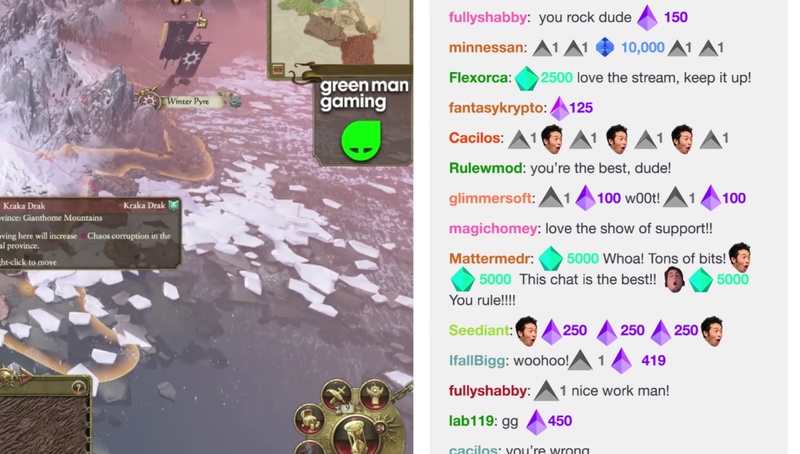 Twitch, the popular game-streaming site, has a funding problem. Not related to the company -- it's owned by Amazon and is just fine -- but its streamers. Like on other video platforms, creators are paid based on ad views and subscriptions, and by all accounts not at a very high rate. While popular streamers make a living -- helped in part by sponsorship deals and the like -- it can be hard for smaller channels to make ends meet. That's why the sub-economy of donations and tips exists, and today, Twitch is trying to formalize that economy with a new feature it calls "Cheering." It all starts with a new Twitch currency called Bits. You can buy Bits "starting at $1.40 for 100," and then fritter them away while supporting your favorite streamer. A Cheer, to be clear, is an animated chat emote. Typing "Cheer1" will generate a grey bouncing triangle, and cost you 1.4 cents. "Cheer100" brings up a dancing purple diamond, and costs you $1.4. You can Cheer any amount you please (including irregular figures, and the corresponding emotes get larger and larger, up to a "Cheer10000," a $140 tip represented by a fractured red star. "If channel subscriptions are the equivalent to holding season tickets for your favorite sports team," said Twitch CEO Emmett Shear, "Cheering is like getting a crowd wave started during the game." As well as feeling warm and fuzzy inside, viewers that Cheer will (probably) get visibly thanked. Streamers can make use of third-party integrations from Muxy, TwitchAlerts and others to automatically generate on-screen messages to thank people for their donations, if they please. Given the positive feedback loop that provides, you'd imagine many broadcasters will take advantage of those integrations. Cheerers will also earn "special badges that make them more visible to the community" in chat. Purchasing a Twitch channel subscription has similar in-chat benefits. At present, only 30 or so big-name streamers are participating in the Cheering program, which is in a "limited beta." All these streamers are "partners" on Twitch, meaning they can already take advantage of the platform's monetization features like subscriptions. Many of these channels take donations and the like through PayPal and other services, and this is a clear play to bring tips within the Twitch ecosystem. There are still some questions to be answered about the program. It's not obvious how much of the money will go to streamers, and how much Twitch will take as a cut. Twitch never discusses such revenue details publicly, but top-tier streamers have previously said (under anonymity due to non-disclosure agreements) that subscription revenue shares are pegged at 70% for streamers, 30% for Twitch. Given all the beta testers for Cheering represent similarly popular channels, it seems likely that a similar figure is in play here. It's also unclear how widespread Twitch wants Cheering to be. It says the feature "will eventually be rolled out on a broader scale as we refine the program based on community feedback," adding that it's "always thinking in terms of how to benefit the broader broadcasting community." But although the vast amount of money will change hands via the massive "partner" channels, Cheering has the potential to be a great way for more niche outfits to make some money for their efforts. Update: After a less-than-pleasant reaction from certain corners of the Twitch community, the company has clarified that streamers will get 1 cent for every Bit pledged -- that's roughly 70 percent, as we postulated. Twitch also assured concerned users that it plans to expand the program to more broadcasters (including non-English streamers) as soon as possible.